Fishes are generally assumed to be myopic (Fernald, 1990). In some taxonomic groups this may be irrelevant as the included fishes may not primarily depend on vision whereas in other groups a variation of optical quality may lead to inter-specific competition or even species radiation (Kotrschal et al., 1998). Cichlid fishes are supposed to rely highly on their visual abilities during survival routines like food detection, gender recognition and predator observation under various ambient light conditions (Fryer & Iles, 1972). Specific variations of niche, habitat and mate selection are reflected as structural and chemical differences in the retinas (van der Meer et al., 1995; van der Meer & Bowmaker, 1995; Carleton & Kocher, 2001; Terai et al., 2002; Spady et al., 2005). Since the cichlid eyes do not specifically differ from the general fisheye Bauwplan, the Cichlidae are an eligible fish-family to study the optical qualities of the fish eye. The similarities in optics and accommodation in fish may easily seduce us to focus on the universalities and to neglect the variations. The latter are especially of interest in an ecological and evolutionary context which is the major subject of research of the Lake Victorian cichlids (Goldschmidt, 1996). The concept of optimal design demands that the optical acuity of the lens is attuned to the retinal resolution as measured in earlier studies and to visual acuity as performed by the fish. This hypothesis relates to the methodological reasoning that structures can in principle be deduced from their adaptive significance or from related structures (e.g. Dullemeijer & Zweers, 1997). Accordingly, the constraints in organic structures are expected to be attuned to each other and to the characteristics of the natural habitat. From a neo-Darwinistic point of view (Fernald, 2004) this does not necessarily be the case. Especially not in organisms with a brief evolution, like the endemic cichlids of Lake Victoria (Goldschmidt, 1996). Since photoreception may have other priorities next to acuity (Van der Meer, 1992) high optical quality as found in haplochromine cichlids (Otten, 1981; Fernald & Wright, 1985) does not necessarily indicate high retinal nor behavioural resolution in species with different ecological needs. A variation of species were used to study lens quality and accommodation. Most cichlids were derived from the life stock at Leiden Univesity and involved several specimens of Haplochromis argens, H. sauvagei and H. piceatus. A Tilapia species (hybrid) and a specimen of Toxotes chatareus were obtained from a local fish shop. A number of small Perca fluviatilis were caught in the Tjeukermeer, Friesland. Adult specimens of P. fluviatilis, Esox lucius and Stizostedion luceoperca were bought at a freshwater fish market. All specimens were kept alive in our laboratory before they were used in the investigations. All fishes were anaesthetized with an overdose of MS222 (1g/l) before they were measured (SL) and both their eyes were isolated. Lenses were separated from the left eyes (which were used for further retinal investigations) and of the right eyes the sclerae were carefully removed. All measurements were carried out in a solution of 0.75% NaCl. A thick PVC sheet with circular wholes (3-6 mm) was placed at the bottom of the glass container holding the solution in order to fix the lens or the entire eye. The bottom of the glass container was very thin (microscope covering glass) to reduce optical influence to a minimum. Lens diameters were measured in four directions using a Nikon projection microscope (20 x). Halving the mean value provided the lens radius (r). 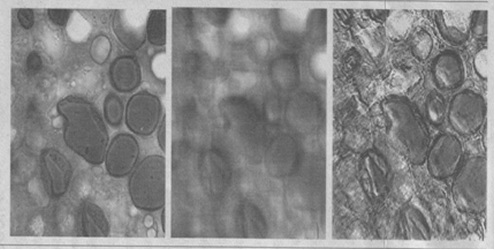 Focal lengths were measured using a slide with testing image mounted in the focal plane of a camera objective (set at infinite) and a water immersion objective (100 x) mounted on a modified microscope. 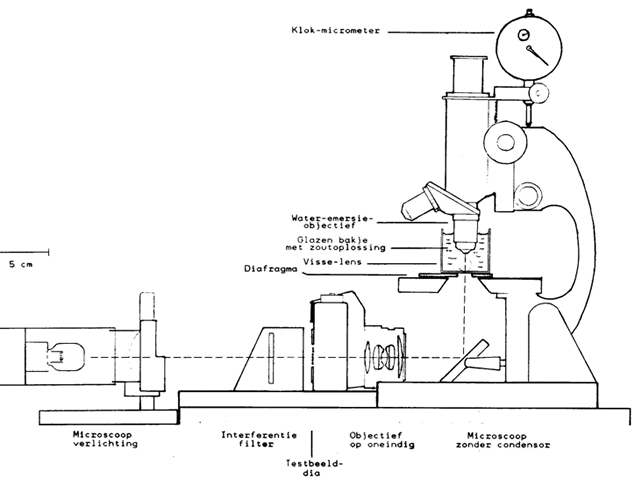 The distance between the lens surface and the projected image of the slide in the focal plane of the eye-lens could be measured with the aid of a circular micrometer mounted on the microscope. The measurements were carried out with red or blue light using interference filters (650 and 436 hm). 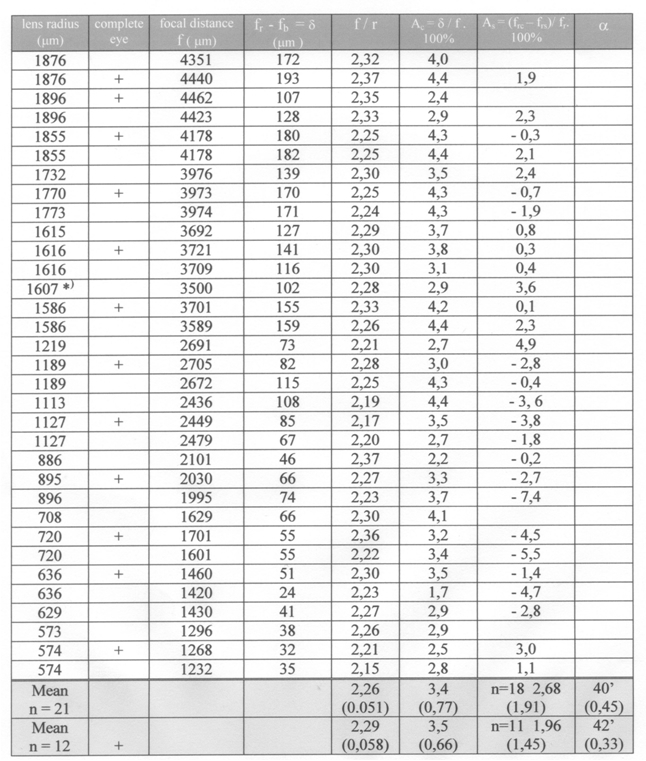 The mean value between the two was used as the average focal length (at ca. 545 hm) and to calculate the ratio between the focal length and the lens radius (f/r). The relative chromatic aberration for red and blue light was given as a percentage deviation of the average focal length (the absolute chromatic aberration is known as the difference in focal length between the ends of the visual spectrum which is not similar in each organism). The centre and surround focal lengths were measured at red light (650 hm; no chromatic aberration) by means of a Schlieren test using an object glass with so-called ring-apertures (black paint; 0,6-3,0 mm) or a non-transparent plastic sheet with reducing-apertures (openings; 1-2 mm) underneath the glass container holding the lens. Ring- and reducing-apertures deviated less than 1% from true circles. Various ring-apertures were used to cover increasing areas up to 50% of the central part of the lens (r varying from 10% to 65% of the lens radius). 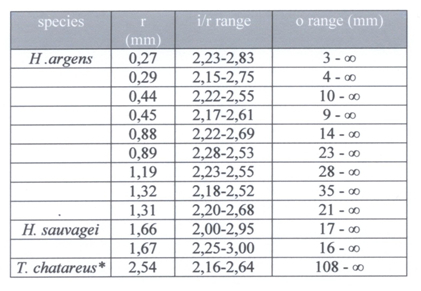 Various reducing-apertures covered increasing areas up to 50% of the peripheral part of the lens (r varying from 66% – 100% of the lens radius). The mean value between the centre and surround focal lengths was taken as the average focal length (in red light). The relative spherical aberration for centre and surround light-beams was given as a percentage of this average focal length (the absolute spherical aberration is known as the difference in focal length between the centre and surround incoming light-beams). Light adapted specimens of the insectivore H. argens and of the molluscivore H. sauvagei were anaesthetized with MS222 (0,1 g/l), measured (SL and r using an Olympus dissection microscope) and killed in liquid nitrogen. Horizontal section through entire heads were taken from some adult specimens of H. argens and H. sauvagei and from some pre-mature specimens of H. argens with the aid of a deep-freeze microtome. Halfway the axial sections through the eyes, pictures were taken of transverse sections of the head or of a separate eye with the aid of a macro objective mounted on a Nikon 35 mm camera. Enlarged drawings were made of the projected pictures which determined the original position of the lens and retina, the shape of the lens and of the eyecup. The image distance was measured from the centre of the lens to the receptive layer of the retina in 11 directions in each section from 15 degrees to 175 degrees in relation to the sagittal axis of the eye lens. The focal length f as a function of the lens radius was superimposed in the drawings together with the image distances matching nearby objects (in) and distant objects (ib) to present the depth of field from nearby to infinity (see below). Visual acuity can be understood as the amount of detail that can be perceived at a certain distance. It is usually expressed as the minimum separable angle a. Visual acuity is limited by diffraction, aberrations and photoreceptor density in the eye (Smith and Atchison, 1997). Apart from these limitations, a number of factors also affect visual acuity such as refractive error, illumination, contrast. Some visual tasks, like target detection, produce hyperacuity or levels of performance over and above the recognition limit (normal visual acuity) and indicate that the mechanisms involved in making such judgements are not restricted to the retinal level (Westheimer, 1987). Diffraction would limit acuity in juveniles if only the constraint of resolution due to angular density of the photoreceptors were not much lower (Van der Meer, 1995). Refractive error is connected with depth of field and accommodation which are explained below and information on receptor densities are derived from other studies. Illumination and contrast will arise in connection with target detection. Acute vision is defined in various ways, depending on the kind of investigation. 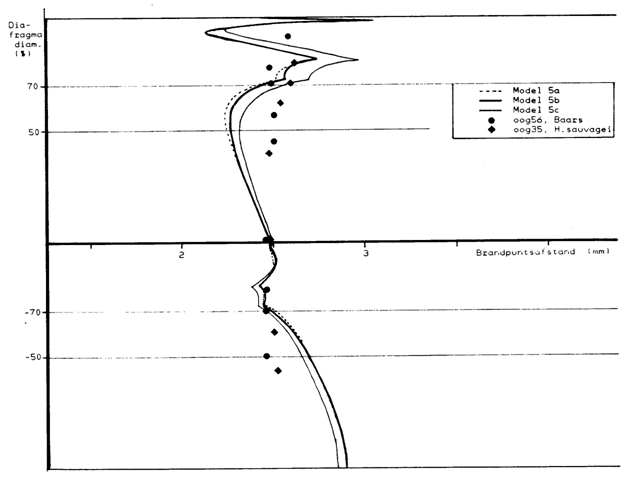 In studies concerning particle detection the minimum separable is defined as the angle among which a particle or prey item can be detected at (maximum) reaction distance (Browman et al., 1990). Optical investigations often refer to acuity as a function of the lens quality. In photography it is usually referred to as the ‘circle of confusion’ (Puts, 2000), not to be confused with the circle of confusion in animal migration movements (Kendall,1974). In retinal investigations the minimum separable is usually determined by the distance between visual units (Otten, 1981). 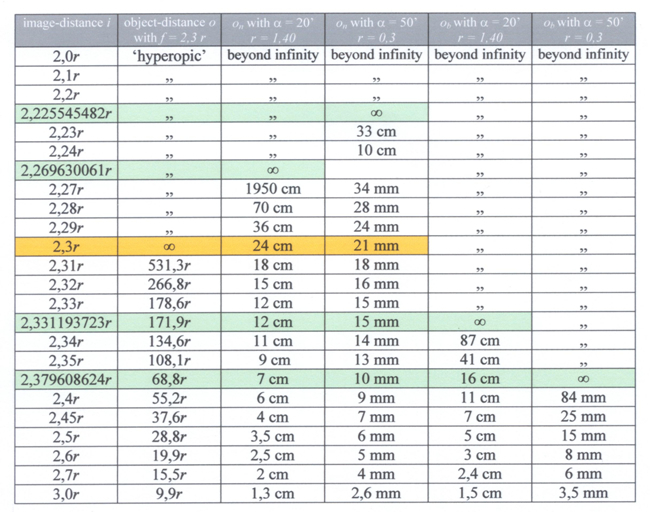 However, the size of these units is disputable (Geisler & Hamilton, 1986; Van der Meer, 1995). where f is the focal length of the lens and i is the image distance. Accommodation may adjust one of these variables ( i in fish)in order to provide acute vision. In man, spectacles may improve acuity, but only if loss of resolution results from ‘out of focus’ or, as in fish, ‘out of image’ that cannot be corrected by accommodation. Even still, the best possible image is slightly blurred due to optical aberrations: the optical resolution. Consequently a point-shaped object is always projected as a small image-disc, the circle or disc of confusion. Also, the distance between the receptive units limits the smallest perceptible details: retinal resolution. As a result of these optical and retinal limitations a range of object distances will provide an disc of confusion that fits within the optical and retinal resolution. When an object at distance o is projected on the retina with an image distance i, the matching depth of field (DOF) extends from an object distance ob (beyond o) to an object distance on (more nearby than o). Without depth of field photography would be extremely limited although most photographers are not aware of this and can easily be calculated (e.g. Puts, 2000; Atkins, 2003). where r is the lens radius and d is the constraint of resolution. This constraint could be caused by the disc of confusion as a result of the optical aberrations, or caused by the distance between the receptive units, i.e. the retinal resolution. From (7) the nearby object distance on can be derive be derived using (1), where ob is infinite, or at least far away. The ratio f/r in H. sauvagei was size independent and rather constant with a mean value of 2,27. There was no clear difference in separate lenses and complete eyes. The f/r ratio in the other cichlids demonstrated a similar constancy with a similar mean value. 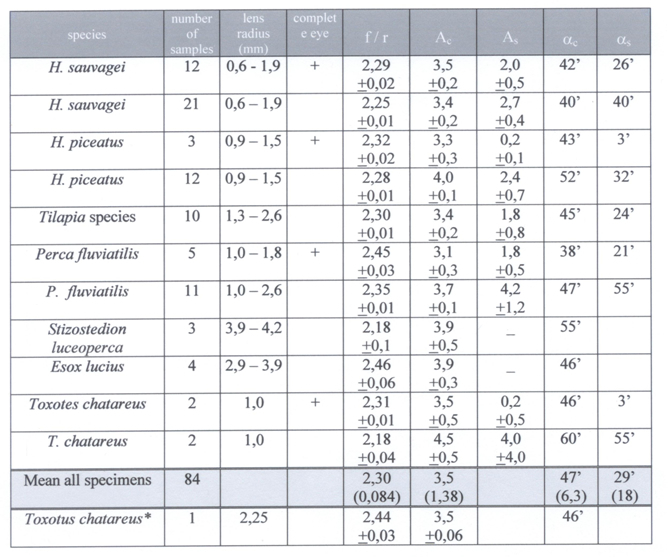 The f/r ratio in the remaining fishes showed more intra-specific variation than it did in the cichlids. Higher mean values were found in perch and in pike, which may benefit the frontal vision on far-away prey in these ambush hunters. Lower mean values were found in pike-perch and in the archerfish. 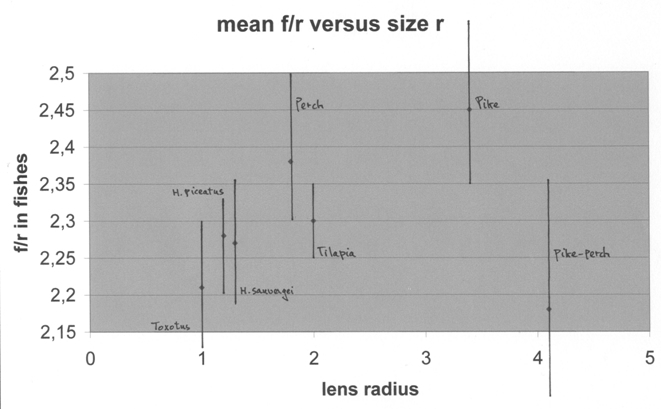 The mean values of the f/r ratio were slightly higher in complete eyes compared to the separate lenses within the same species measured. This is possibly due to small injuries in isolated lenses. Since perch and pike-perch belong to the same family and their focal lengths seemed to be different, their life-style is apparently of more importance than their relationship. In this line of thought the archerfish was expected to have a larger focal length since it is known to spit drops of water with great accuracy at 3 m (10 ft) to hit a small target. It may have better accommodative abilities or a more circular shape of the eyecup. All in all the focal length seems to be a species-specific characteristic. The chromatic aberration was independent of eye-size and about the same in all species (ca. 4%). It is obviously the limiting factor with regard to lens quality. Similar values were found in other species, like trout (4,5%, Scroczynski, 1976), rudd, (4,6%, Scholes, 1976), rock bass (4,1%, Sivak & Bobier, 1978) and perch (4,5% Scroczynski, 1979; Otten, 1981). 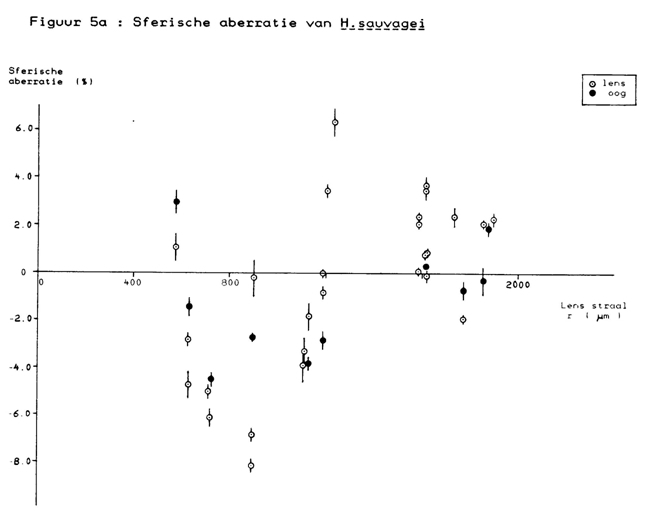 Otten (1981) found a much lower value of 2% in H. elegans just as Fernald & Wright (1985) found in H. burtoni. 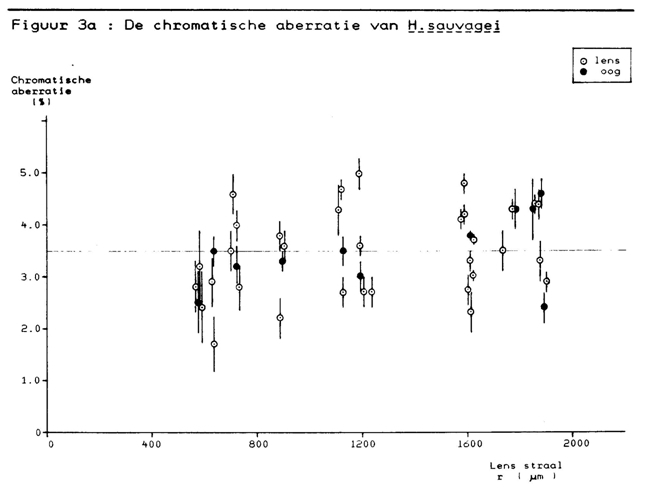 The deviation of these values from the chromatic aberration found in other haplochromine cichlids as mentioned in this paper is not understood, especially since Otten used the same technique to measure the chromatic aberration in perch and found a similar value as mentioned in this paper. A major difference between these closely related haplochromines is that they originate from different lakes (where they were endemic): H. burtoni from Lake Malawi, H. elegans from Lake George and H. sauvagei and H. piceatus from Lake Victoria. 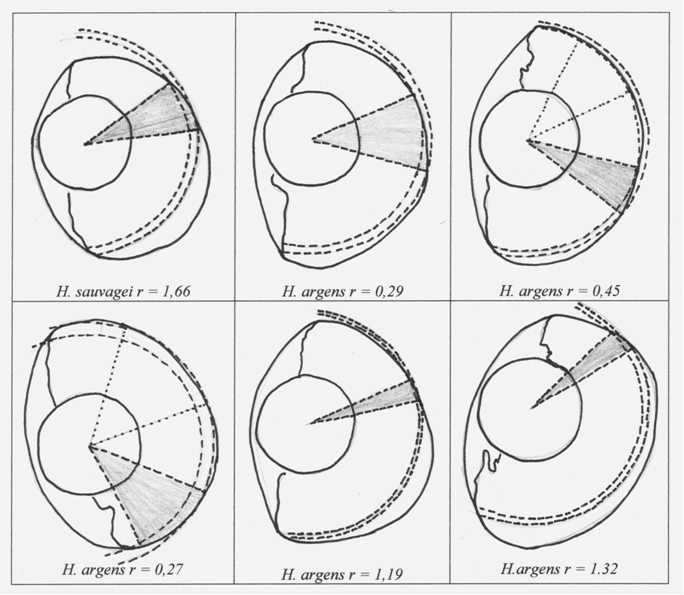 The spherical aberration was also independent of eye-size but showed much variation, even between the eye lenses of one specimen, varying from almost nothing to –7,4%. Absolute values were used to calculate the mean spherical aberration, which measured 2,4%. The spherical aberration was more express in all species than was expected on basis of the gradual shift of refractive index in the successive layers of the lens. 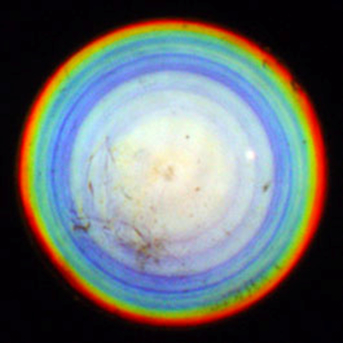 Cross sections through plasticised lenses revealed concentric rings suggesting a homogeneous core surrounded by a limited number of three or four layers in all lenses. Refractive indices rising from 1.38 to 1.556 were ascribed to the few layers and core, applied to several ray-tracing models using polynomial regression and compared to some of the results in fish. Even the best model shows considerable aberration that exceeds the measured aberration in the fish eyes. Apparently the number of layers in the cortex is much higher with a more continuous refractive gradient (Jagger, 1992). The lower values of both spherical and chromatic aberration when measured in intact eyes may indicate that isolated lenses suffer small damage of the exterior layers of the lens which are quite vulnerable. In all investigated eyes there was at least one spot where the image distance equalled the focal length, generally situated in a rostral area. The matching infinite object distance was directed backwards. The shorter object distances were directed forward as much as anything. Since over a broad retinal region a simultaneous projection was realized of nearby objects in front of the fish to distant objects in the rear with sideways every object distance in between, one cannot persist to call these fish myopic. If anything, they are polyopic. Similar results were found in other cichlids (Anker & Dullemeijer, 1996) and in trout (Jagger & Sands, 1996) although these authors do not mention the simultaneous imaging of nearby and distant objects. The currently accepted opinion that fish are myopic was also contradicted by Baylor & Shaw (1962) who studied the eyes of alewife (Alosa pseudoharengus) and silversides (Menidia menidia). Although the eyes of H. argens were relatively larger than the eyes of H. sauvagei, no specific difference in shape could be established. The eye shape did not change with eye size. The eye-cups were not circular: the sections were slightly elongated and the caudal area was more or less flattened and more strongly curved towards the medial part of the cup. Consequently, the image-distance was never the same in every direction irrespective of the position of the eye-lens. Moreover, the position of the lens was different, even in the two eyes of one specimen. The range of the image distance per eye was therefore preferred over the mean values. In all cases the range of the image distance varied from lower to higher values around the connected focal length. In general, the largest image distances were located in the caudal areas. The position of the image distance equal to the focal length was on most occasions in the rostral area. The application of depth of field on basis of various constraints of resolution (see below), provided segments of retinal areas with matching object distances varying from several centimetres to infinity. The depth of field from nearby to infinity was much enlarged with increasing constraint of resolution while it varied in a similar proportion as eye size. 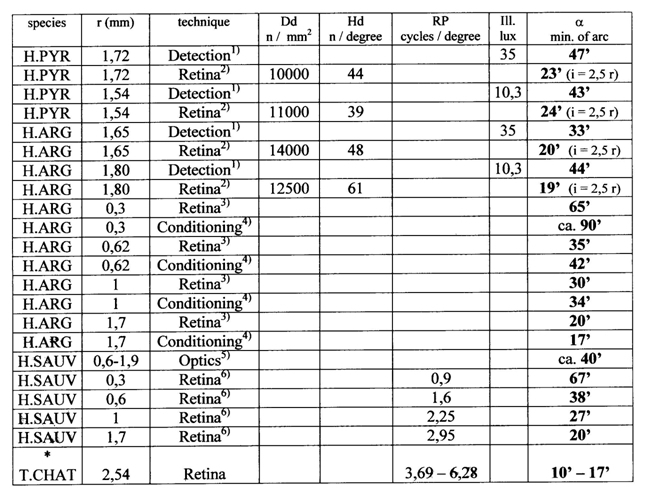 Accordingly, the retinal area providing the best possible image (a = 50’) was defined between in = 2,465r and ib = 2,226r in juveniles (r = 0,3 mm) with a depth of field from 1 cm to infinity. In adults (r = 1,4 mm) the best possible image (a = 20’) was defined between in = 2,363r and ib = 2,27r with a depth of field from 7 cm to infinity. In this study no lens movements were recorded. When an object at certain distance is projected within the optical definition, the application of depth of field shows that sharp images from nearby to far-away objects are produced within a certain retinal region. This region is pretty large in juveniles and becomes smaller in adults due to the improvement of retinal resolution during ontogeny. For next to eye-size the increasing retinal resolution is to be accounted. The value of the minimum separable angle has of course influence on the size of this retinal region. However, since cichlids, like most other fishes, have no fovea, each retinal region is as functional as the other, independent of the minimum separable angle or the visual direction of that region. Although accommodation was not studied, its presumed performance has been described elsewhere (e.g. Fernald, 1990) and its potentials are worthwhile to speculate upon. The position of the lens in relation to the retina is, presumably, not fixed. Neither is it clear to what extend and in which direction the lens can move, although in most fish species the accommodative movement is carried out along a more or less horizontal axis (Fernald, 1990). 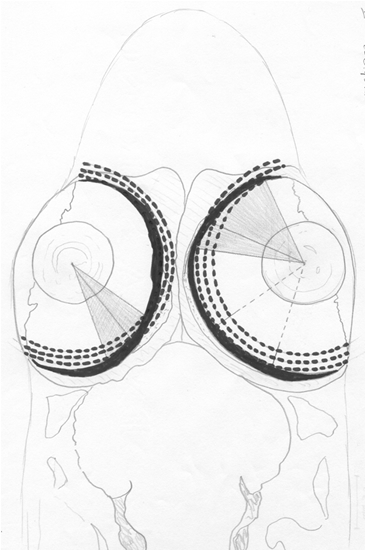 The present study examined a possible displacement of the lens to provide far away vision in frontal direction. The lens would then shift towards the caudal part of the retina (with the aid of the m. retractor lentis) over a distance equal to 10-25% of lens diameter. As a result of the depth of field and of the non-circular retinal curve such a displacement of the lens is not necessarily restricted to shift the imaging of distant objects from the rostral towards the caudal part of the retina. In fact, the displacement may even widen the imaging from nearby to distant objects in various directions as is shown in the hypothetic maps. This possibility seems quite plausible. On the other hand one cannot exclude that the lens was already in its most caudad position. Accommodation could then only result in a forward moving of the lens providing even more extreme nearby vision in front. As a matter of fact, observations on living cichlids during feeding experiments and during anaesthesia with MS222 (a muscle release) revealed a movement of the lens in forward direction (G. Ch. Anker, pers. comm. ; H. J. van der Meer, unpublished). This suggests that the m. retractor lentis is permanently active and retracted to some extend. Since a slight displacement of the lens is sufficient to obtain sharp images of objects at different distances in various directions, a higher frequency lens-movement may simultaneously provide images of all these objects. The images may be less sharp, but if the retinal processing has similar abilities as modern digital imaging technology, it would result in a great extension of the depth of field similar as in wavefront coding (Dowski & Cathey, 1995; Cathey & Dowski, 2002). Most of the data on acuity originate from retinal analyses and are derived from the planimetric densities of the double cones (Van der Meer, 1994, 1995; Van der Meer et al., 1995). In all studied haplochromines these densities were highest in the caudal regions and lowest in rostral parts of the retina and gave similar mean. The calculation of a involved an estimation of the image distance and the number of double cones comprising a photopic unit. A range of the image distance from 2,3r to 2,7r caused a variation of a of only 2-3 minutes of arc. A mean image distance of 2,5r was chosen. 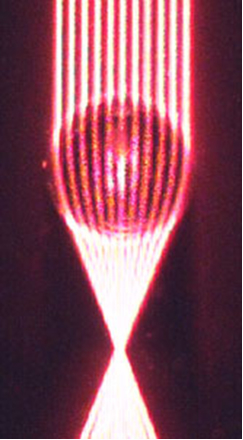 A photopic unit was used as described by Otten (1981) which coincides with the density of two double cones. The calculated minimum separable angles, which are proportional with the lens radius, were based on the mean cone densities (and not on the higher caudal densities).. Nevertheless, on all occasions they were lower than the optical and behavioural values. Van der Meer (1995) proposed an even smaller photopic unit which would further decrease the minimum separable angle with a factor 2. Unpublished analyses revealed a still better retinal resolution in Toxotus chatareus due to large eyes and high cone densities. 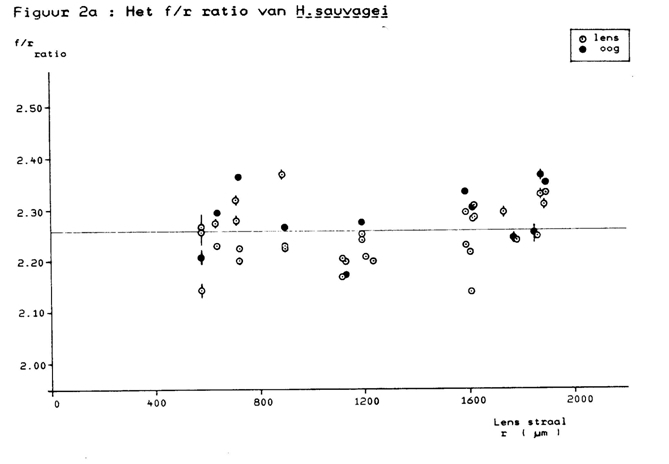 Using the principle of optimal design, Otten (1981) predicted maximum eye size based on the constant optical acuity and the increasing retinal acuity during growth. He did not take into account that the eye (and retina) can continue to grow without increasing retinal resolution by an increasing enlargement of the cones or a strong decrease of the cone packing (Van der Meer & Anker, 1984; Van der Meer, 1992). During pre-adult growth when the optical quality is not yet a constraint, the retina can develop in various ways depending on habitat and niche of the species. However, a retinal acuity restricted by an optical acuity would not agree with the concept of optimal design. Still, neuronal processing and environmental clues may be involved as well. Westheimer (1987) already referred to higher neuronal levels of visual performance. Furthermore, fishes may suffer less from optical aberrations as the spectral composition of their natural environment is much narrower than the difference between the interference filters used in this study. Clearly, the optical, retinal and behavioural acuities are not attuned to each other. Operant conditioning suggests better acuity in adults and worse in juveniles in comparison with the retinal analyses. Although divergent data on visual acuity seem rather common when using behavioural analyses (Douglas & Hawryshyn, 1990), the experiments with visual food detection suggest a much worse acuity. These results are, therefore, not considered reliable as they seem to depend to much on light level and tank-size. The major disturbance comes from the lens quality: in all studied species the chromatic aberration limits acuity to a similar degree of 3,5% of the focal length, which is substantially worse than was expected on the basis of earlier behavioural and retinal analyses and on the basis of other studies of cichlid lenses (Otten, 1981; Fernald & Wright, 1985). Even the high retinal resolution of Toxotus chatareus seems to be annulled by the chromatic aberration which is completely off the wall in a fish that is able to spit off an insect from a branch at two meters above the water surface. Maybe a blurred image is inferior to sufficient contrast and movement. Otten (1981) proposed a correction of the chromatic aberration in the perch by the colour filtering of its yellow cornea. If a smaller range of the chromatic spectrum would admit a larger chromatic aberration of the eye lens, one could use the same argument for the reverse: if the chromatic aberration is clearly smaller (as found in H. elegans and H. burtoni) this may be so because the spectral transparency of the lens is broader, e.g. include the UV. Proteins of the optical media like cornea, lens or vitread body have indeed the ability to absorb or transmit in the invisible shorter wavelengths (Losey et al., 1999) and they may differ even among closely related species like the Lake Victorian haplochromines (Andrea Thorpe, pers. comm.) and are functionally explained as improving visual performance through the reduction of chromatic aberration (Douglas & Marshall, 1999). 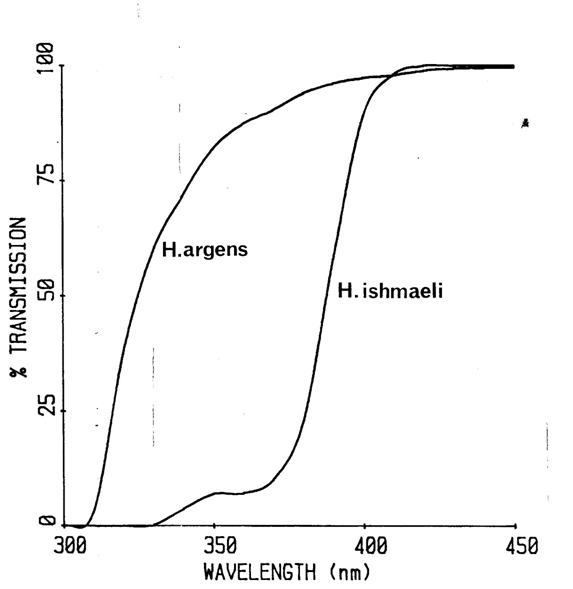 Accordingly, one should expect the high definition lenses of H. elegans and H. burtoni to compensate for the lack of UV absorbance by any of the ocular media, whereas the more severe chromatic aberration in other species could be reduced by UV filtering of the cornea or vitread body. A combined investigation of the chromatic aberration of the lens and the absorbance / transmittance of UV by the optical media may solve the problem. Since no other unambiguous minimum separable angles could be rendered than the ones connected to eye-size, only two values of a were used in this study: a =50’ in juveniles and a=20’ in adults. Cichlids are not myopic. On all circumstances they have acute vision from nearby to infinity. Accommodation is useful: it mainly serves to change direction of the acute vision. The concept of optimal design is not supported. Unlike its self-evidence the optical and retinal resolution are not simply attuned to each other nor are they clearly connected to visual performances by fish. The general conclusion is that cichlids need no spectacles to fulfil their visual tasks. If any prescribed prosthesis, they might profit from sunglasses, i.e. a cut-off filter to reduce chromatic aberration. Apart from the inconvenience and the aesthetics, the inhabitants of the increasingly turbid Lake Victoria would hardly benefit from an extension of their (restricted) farsightedness. After the eutrophication in the last decades they are better served with an improvement of their visual sensitivity. What indeed has happened.